"In an ironic twist of fate, those shouting loudest about Russian ‘fake news’ and demanding that the West take action against RT and other Russian media outlets, are now finding themselves accused of being Russian agents." A Russian link to Boris Johnson and Michael Gove’s successful plot to persuade Theresa May to take a tougher stance on Brexit has been uncovered by the Mail on Sunday. This newspaper has established that a secret letter sent by the Cabinet Ministers to the Prime Minister was co-ordinated by a senior figure in a free-market think-tank founded by a tycoon who made a fortune in Russia following the collapse of the Soviet Union. In their article, Walters and Owen reveal that the Legatum Institute’s economics director, Shanker Singham, helped Johnson and Gove write an ultimatum which they sent to Prime Minister May demanding that she ‘force Chancellor Philip Hammond to do more to plan for a “hard Brexit”.’ So there you have it. 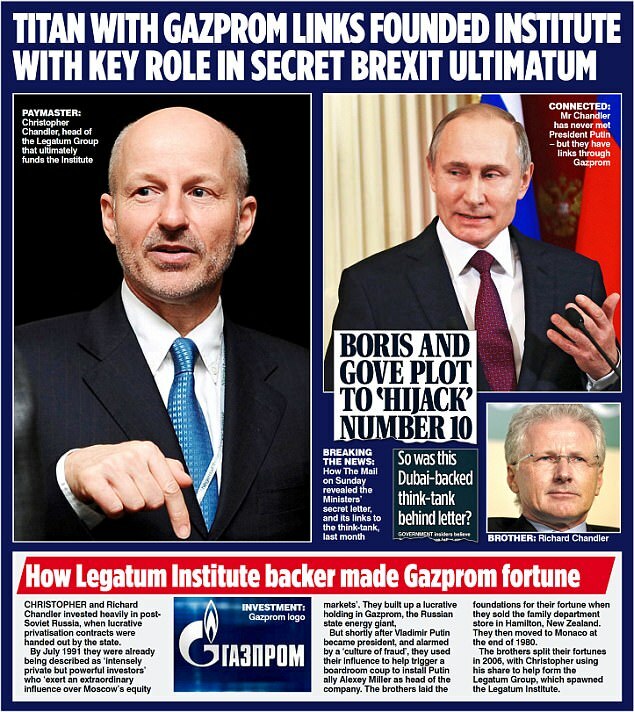 The Legatum Institute’s founder got his money from business deals in Russia, including a deal with Gazprom; the Legatum Institute’s finance director helped Johnson and Gove write their letter; ergo, there’s a ‘Putin link to Boris and Gove Brexit Coup’. Oh, the joy! This is ironic! And not a little bit funny. The Legatum Institute as a subversive Kremlin agent. I’m having a very quiet giggle at this one. Let’s be honest. I’m not at all inclined to come to the Legatum Institute’s defence. And I never imagined the day would come when I would say that Michael Gove had been unjustly accused. I’d be happy to defend Boris, but Michael? Until today, I’d have thought it impossible. But here goes: this article is a load of nonsense. It’s not that it’s factually incorrect – it isn’t; it’s just that story it implies – that Vladimir Putin is manipulating Brexit via Legatum, Johnson, and Gove is completely wrongheaded. If the Mail on Sunday had taken just one second to investigate the Legatum Institute it would have worked this out for itself. Legatum’s denizens include such well known Putin-lovers as Anne Applebaum and Peter Pomerantsev. The Institute published Pomerantsev’s report (co-authored by Michael Weiss of the obviously Kremlin-controlled website, The Interpreter) The Menace of Unreality: How the Kremlin Weaponizes Information, Culture, and Money, which I reviewed here. And the institute hosted a conference entitled ‘Russia: A Post-Modern Dictatorship?’ to coincide with the publication of a paper by Pomerantsev with the same title. Among those speaking at the conference were a couple of other famously pro-Kremlin Russians: Pavel Khodorkovksy (son of jailed oligarch Mikhail) and Vladimir Kara-Murza, allegedly twice poisoned for his anti-Putin politics. In an ironic twist of fate, those shouting loudest about Russian ‘fake news’ and demanding that the West take action against RT and other Russian media outlets, are now finding themselves accused of being Russian agents. It is, of course, completely absurd. But I can’t help thinking that what goes around comes around, and that Legatum and co. have only themselves to blame for their predicament. In creating the hysteria about Russian interference in Western politics, they established the conditions which made the assault on their own position possible. If you start a witch-hunt, you shouldn’t be surprised if one day the Witchfinder General comes looking for you.